Unfortunately, vehicle accidents happen every day and many could be easily prevented. Let’s take a look at the most common crashes on Australian roads and how you can avoid becoming a statistic. 1. 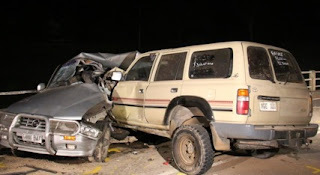 Nose-to-tail - Also called the ‘rear-ender’, nose-to-tail car accidents account for the highest number of crashes on Australian roads. The main cause of a rear-ender is not enough space between cars. As a general rule, it is advised to keep a three second gap between your vehicle and the one up ahead (more in poor conditions, such as wet weather). 2. Side-on - Adjacent direction crashes are second on the list and are mostly caused when a vehicle fails to give way. The reasons for this are usually to do with reduced visibility such as poor or blinding light or obstructions, but can also be caused by carelessness. To avoid side-on accidents, check and double check before crossing intersections, always proceed with caution and prepare to brake in a hurry. 3. Head-on - Opposite direction collisions are usually caused by vehicles up ahead wanting to cross your path. This is mostly to do with time and gap judgement. If you are in the car waiting to turn in front of an oncoming vehicle, remember the old saying ‘it’s better to be safe than sorry’, and just wait it out if you’re unsure. If you are in the moving car and see another vehicle waiting to cross your path, back off the accelerator and be prepared to brake. 4. Off path in a curve - Speed is a major factor in cars running off roads in a corner. Remember to always stick to the speed limit and use caution on bends. There are often signs along windy roads with recommended speeds for entering each corner, so take note and slow down! 5. Off path in a straight - Driver fatigue, swerving to miss an unexpected obstacle and other distractions such as mobile phones, can all result in driving off a straight road. Minimise these by ensuring you are always well rested and alert before getting behind the wheel of your car. If an obstacle appears on the road ahead, slow down and take note of your surroundings; try to avoid swerving. As for the mobile phone, turn it off or on silent and place it somewhere out of reach so you are not tempted. As a driver, the best advice if you are unsure is, slow down and proceed safely.